Enlarge Acoustic foams can soften or absorb sound and thereby influence the acoustics of a room. 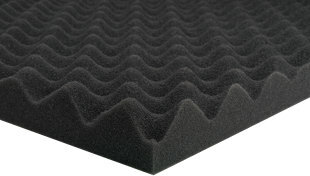 Acoustic foams are so-called porous absorbers. Porous absorbers include all porous and fibrous materials such as foams, textiles, carpets and special acoustic plaster. 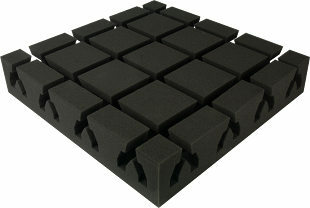 Our profiled foam is a high-quality sound absorption material on a polyurethane flexible foam basis. It offers broadband sound absorption across a wide frequency range (porous absorbers). Thanks to the optimised flow resistance and its structured surface, this sound protection product combines excellent sound absorption properties with an attractive appearance. Through its tilt angle and pore structure, we have achieved excellent resonance reduction. for general sound reduction measures, etc. 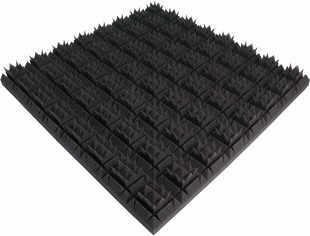 Pyramid foam - polyurethane flexible foam in pyramid form in the measurements = 56 x 56 x 6 cm. 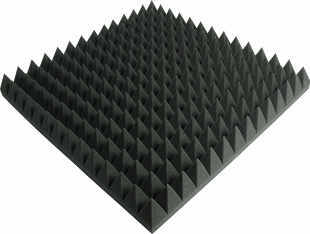 This pyramid foam is a high-quality sound absorption material on a polyurethane flexible foam basis. It offers broadband sound absorption across a wide frequency range (porous absorbers). Thanks to the optimised flow resistance and its structured surface, this sound protection product combines excellent sound absorption properties with an attractive appearance. We have developed a "new" improved acoustic pyramid. Attractively designed, this innovative acoustic technology turns "sound into an experience". Our professional sound dampening systems make "noise a thing of the past". These Pyra Bass Traps are easy to set up and there is no problem with adhesives or adhesive residues if you move. Your acoustic equipment can simply move with you - to your next studio job, rehearsal, a.s.o.